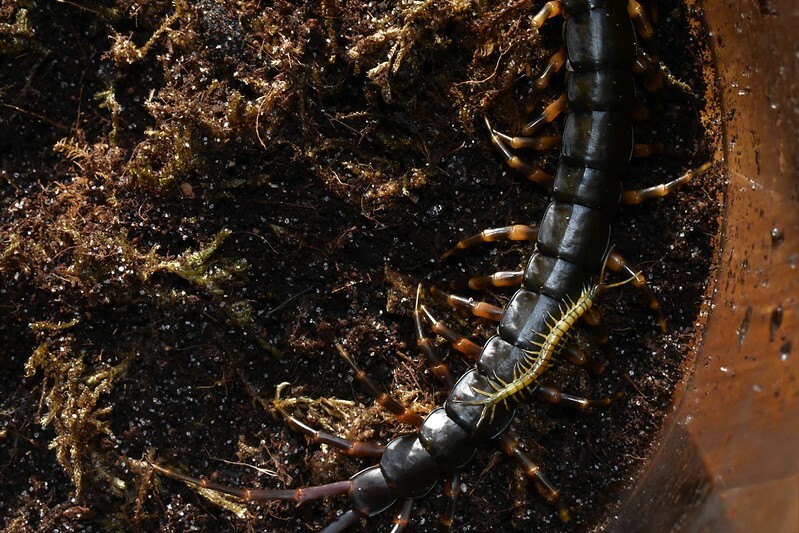 Discussion in 'Myriapods' started by LawnShrimp, Nov 20, 2017. Might as well make a thread for all these 'pedes. S. hainanum- not sure who, actually. Could be Megaera before she egged up. 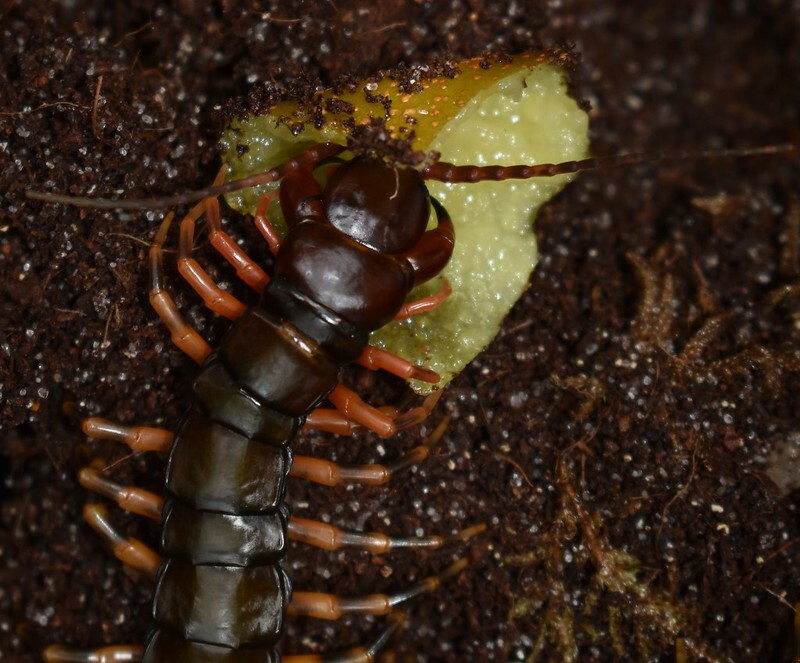 Tisiphone eating kiwi. She's lost interest in fruit now. She is always sitting around, never active or moving, but she rarely hides. Alecto and her kids! She's been a caring mother, and even though she was skinny when she laid eggs and didn't eat for almost three months, she has never attacked her young. Megaera is just as doting but twitchier, so I don't have any pictures of her. Mutilans eating some kiwi. I have three of these left of a group of six after a strange illness. 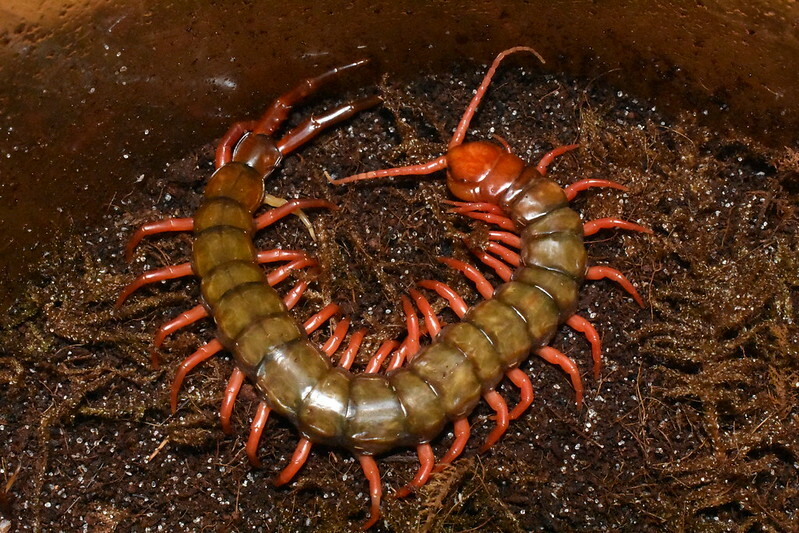 I attribute it to these being inbred in farms in China; the red-legs are prized as traditional medicine there. I hope these last few survive. 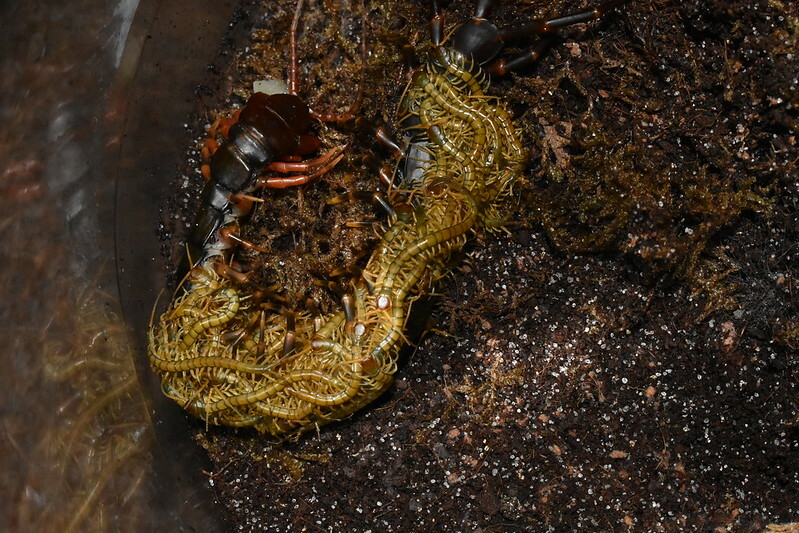 They molted communally without problems. The three's personalities range from nervous to defensive to very docile. The latter is a sweet little thing; you can gently pick her up with forceps and she doesn't struggle. She doesn't show mercy to crickets though. 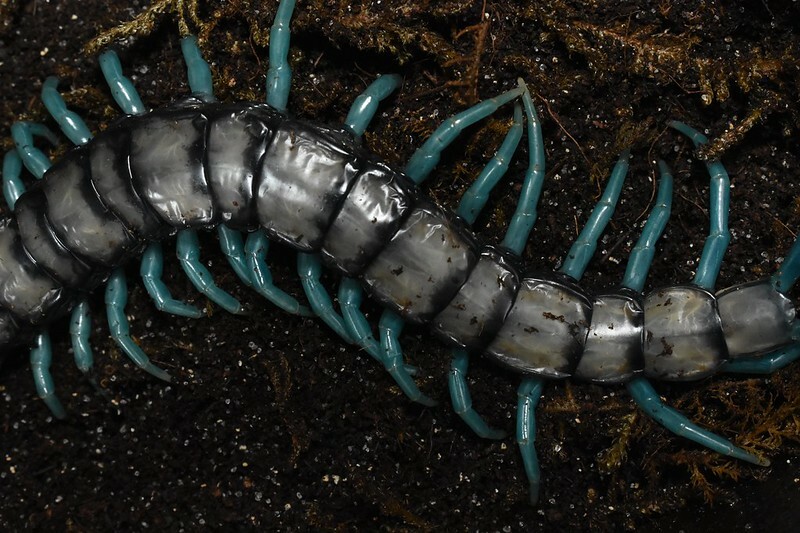 Langoustine is not the most personable critter. It is nervous and meek, but I still love it. Previously misidentifying it as morsitans, I think this is a S. multidens form; similar pictures from China list it as "S. multidens Chinese Brownback". 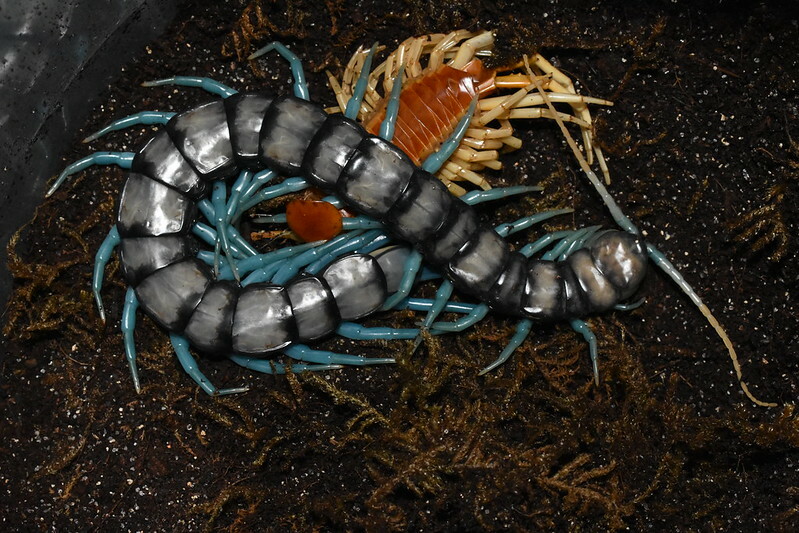 It's got funky molt colors. 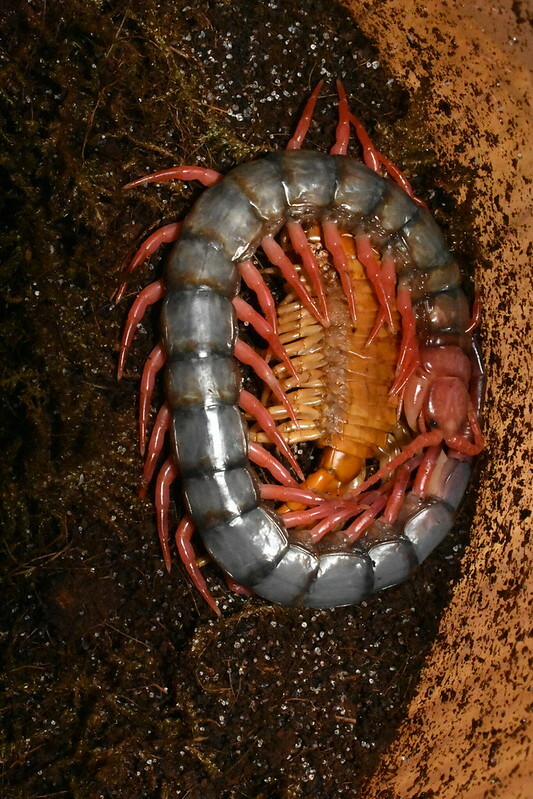 I'm a little worried about it as after it molted and hardened, it refused food and is burrowed deep. 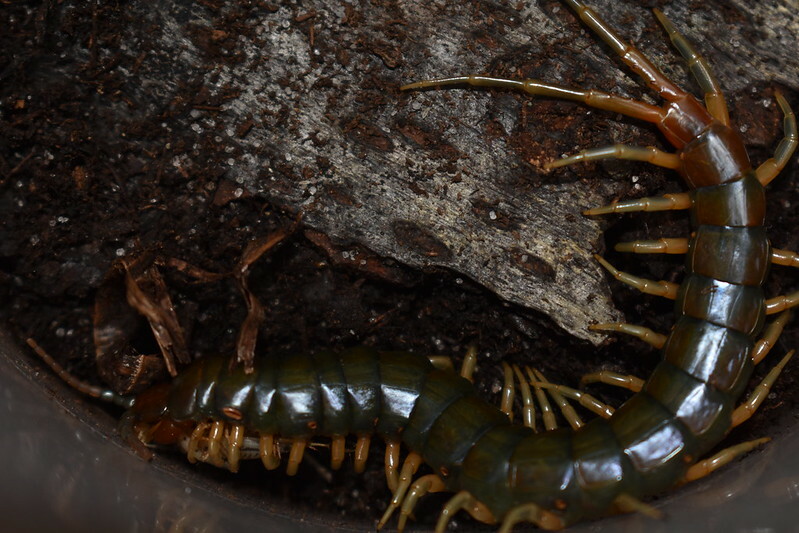 I've dug it up once but it didn't eat and it burrowed back down. Perhaps it is hibernating because of the cold, but I wish it had a full stomach to do so. Should I get a heat mat for this one or put it near a radiator? R. longipes. 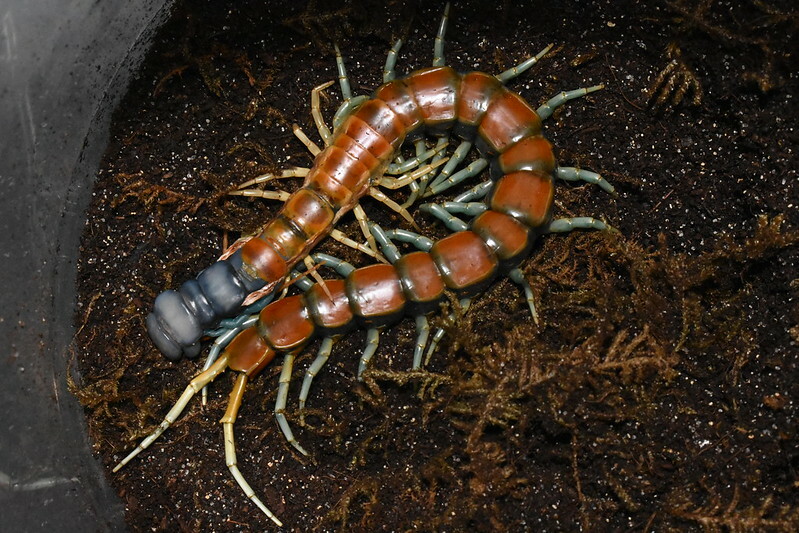 My first 'pede, she's not as colorful, active, large, or aggressive as others, but she's got a place in my heart all the same. Jules the "Mint Legs". My very own murderous, hyperactive, lighting-fast blue-legged psycho. Jules makes dehaani seem like millipedes in terms of speed. 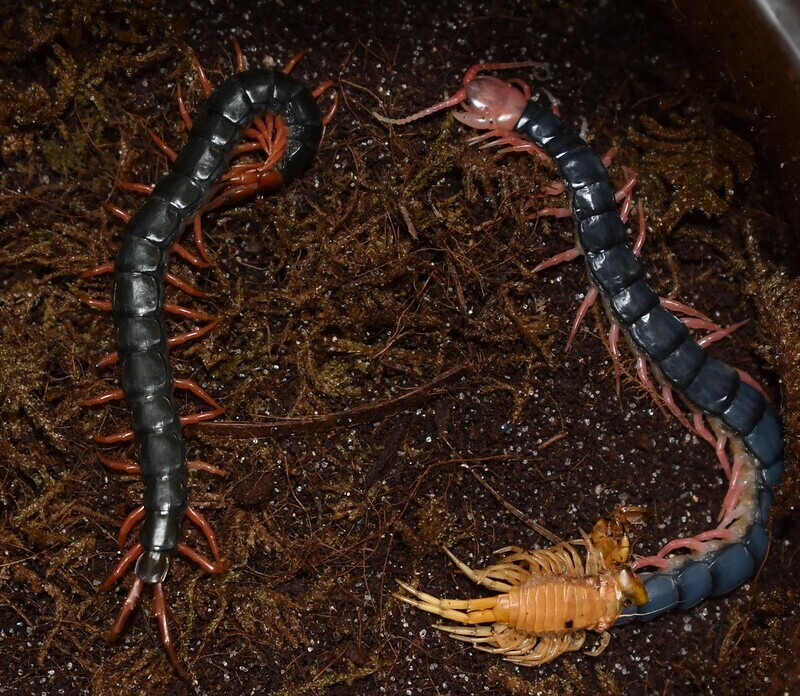 Possibly the best molt colors I've seen on a centipede. Jules has refused kiwi as post-molt food yesterday. 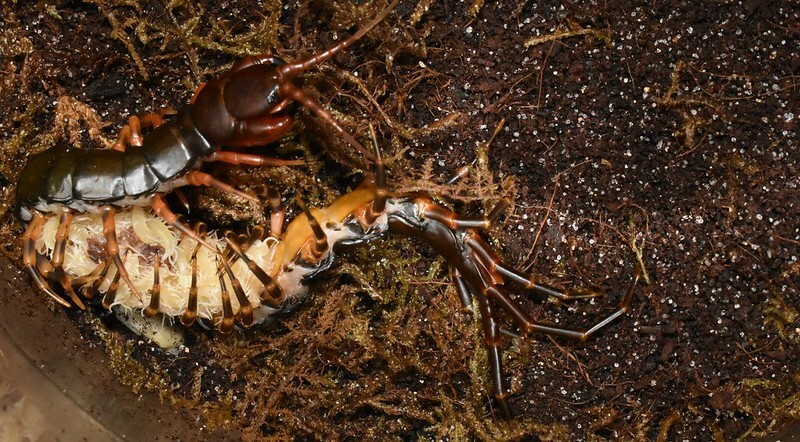 Should I try banana or prekilled crickets next? Jules hasn't eaten in several weeks and I don't want it to do the same fasting/hibernation that the multidens did. Nothing more innocent than a baby hainanum. 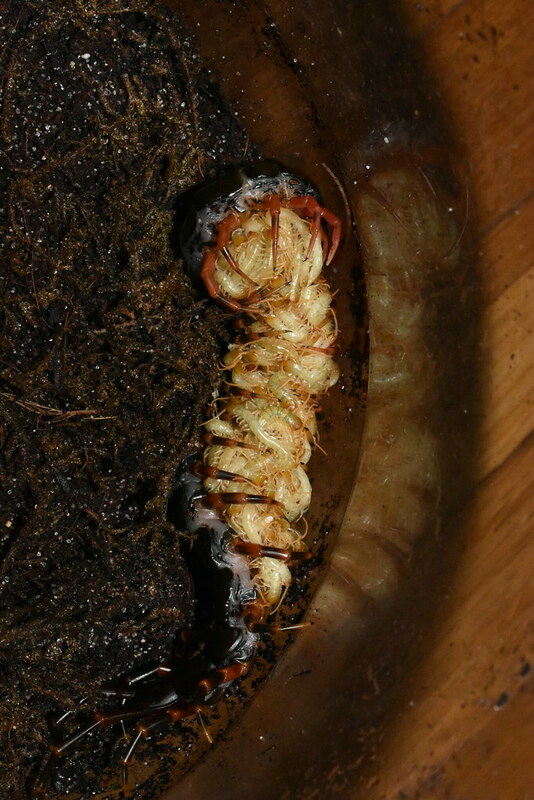 The pic of that freshly molted "mint legs" wow! That is insane, just gorgeous. How long does the mint legs stay that color? About an hour; it turned yellow soon and at this moment is a pale brown, about half as dark as it usually is. By tomorrow it should be the usual color, though the shell will still be soft. Awesome pedes. Thanks for sharing. These are beautiful animals! I would love to get one someday if my boyfriend would let me. For now I'll just live vicariously through all the lovely pede owners out there like you . I like mutilans too; back then I wanted to get some but I was disappointed to hear they only got to around 15cm (right?) which was a bit small for me. Can't say about the rest because I have them all muahahhahaaaa. But gr-eat pictures nonetheless. You might have answered the same question in other threads (sorry ) but what camera do you use? It's worth it to get a few. They are small, but older females can get closer to 16.5 cm, at least in China. 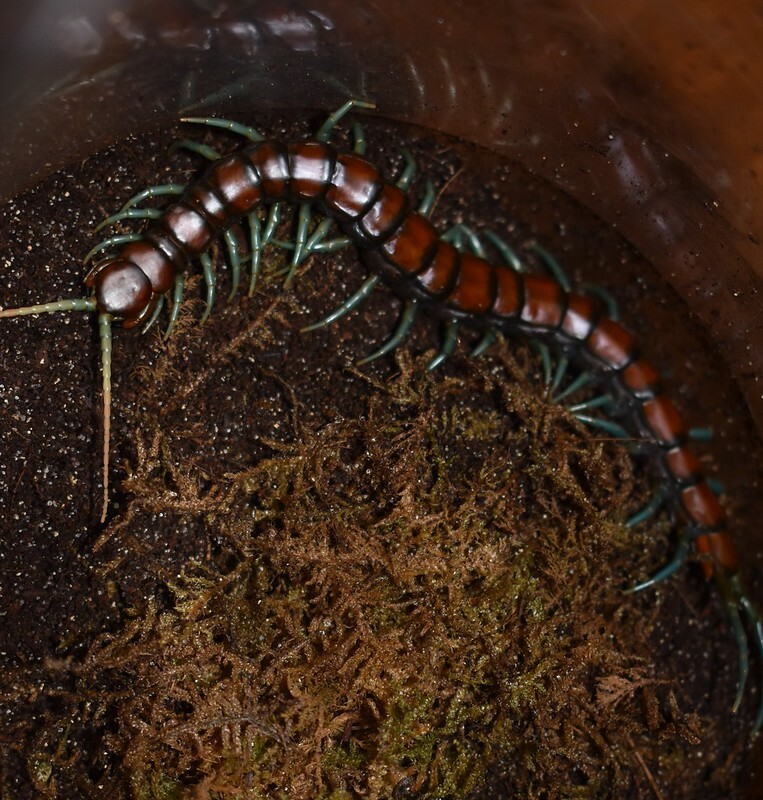 Despite their size, having a container with as many centipedes in it as you want is great! They sleep in piles and will interact with each other with cute little motions. Some are very docile and good candidates for handling. 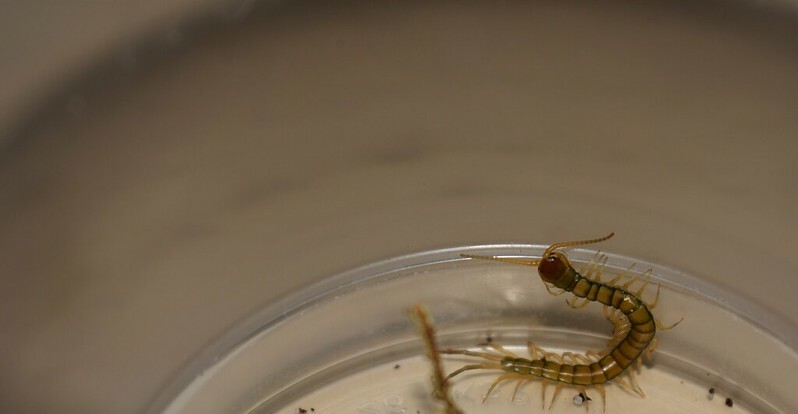 There are also cool morphs: yellow leg, red leg, green body, yellow body(hypomelanistic). 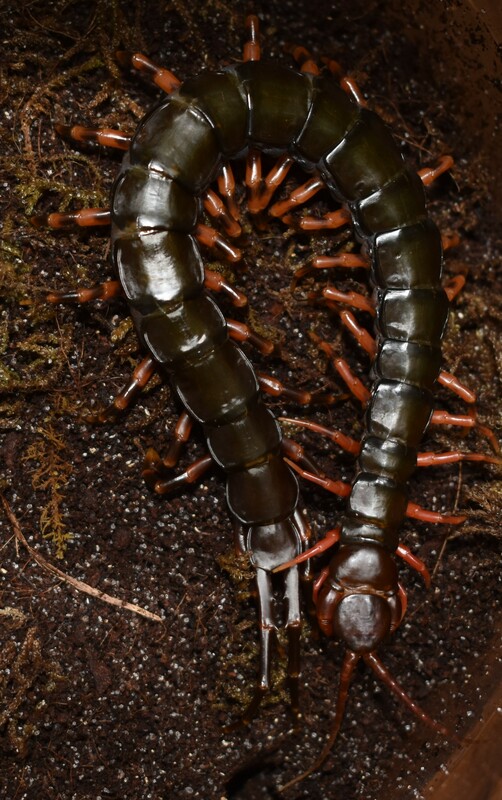 If you get regular morphs, stay away from those mass-reared in farms; this is one centipede that is better to get wild caught. Really nice looking pictures! Concerning your camera, I would have expected a higher price point. I'm hooked! May be a future purchase. Anyone know about hibernation? My multidens isn't up yet and my Mint Leg is almost hardened fully and is still refusing fruit and meat. You did a great job with the pictures, it really brought an impressive view of them. They all look vibrant and beautiful, and it looks like you take good care of them. Most of them seem a really ideal weight and seem healthy. Great pics and pedes my dude. Don't know about hibernation. Any info on the climate in china? 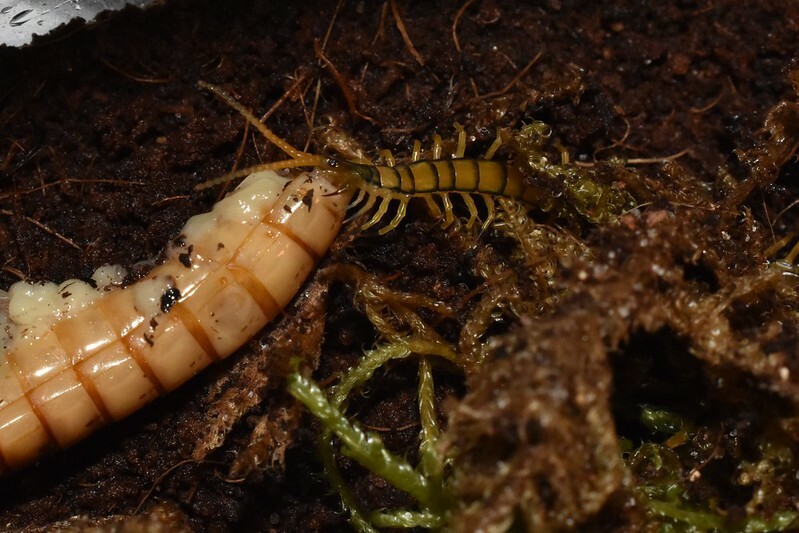 talking about hibernation ，it seems very risky for centipedes as a lot of Chinese keepers who tried this lost a lot of their centipedes，but i heard that mint legs sometimes hibernate in their native habitat ，but the temperature there rarely goes lower than 7or8 celsius. The annual average temperature around the whole Guangxi is about 16.0℃~23.0℃; the annual extreme maximum temperature in each district is about 33.7℃~42.5℃, the annual minimum temperature is about -8.4℃~-2.9 ℃. The average temperature [in Hainan] during the year ranges from 23 °C (73 °F) to 26 °C (79 °F). I think both Mint Leg and hainanum are from mountainous areas, though hainanum can tolerate much lower temperatures. 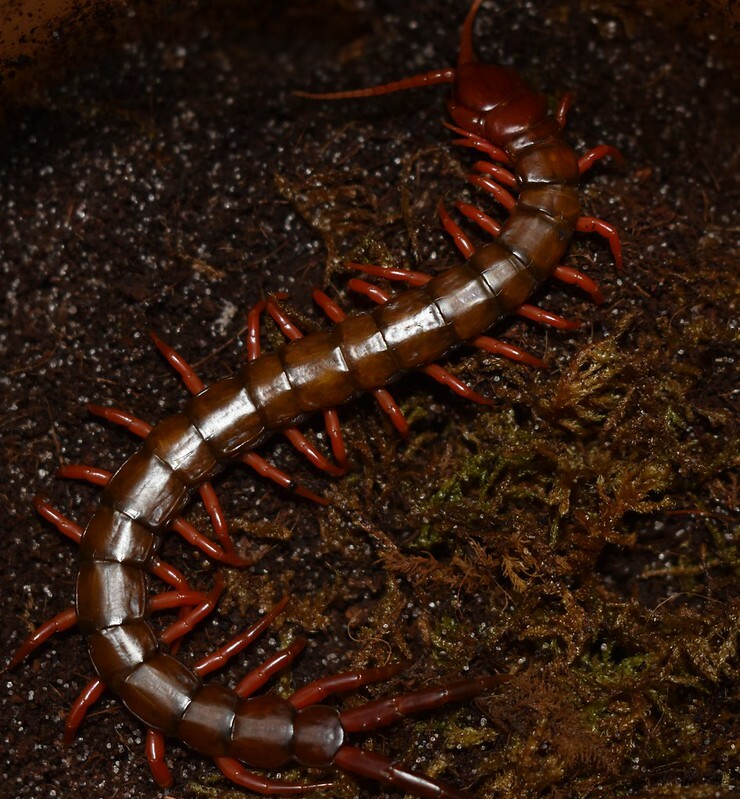 All my centipedes are kept at around 19 Celsius (66F). I don't use heat mats as they apparently cause a lot of problems, so they are all at room temperature. I'm not trying to hibernate them but if they want to then I can't really stop it. It probably extends their lifespan anyway. 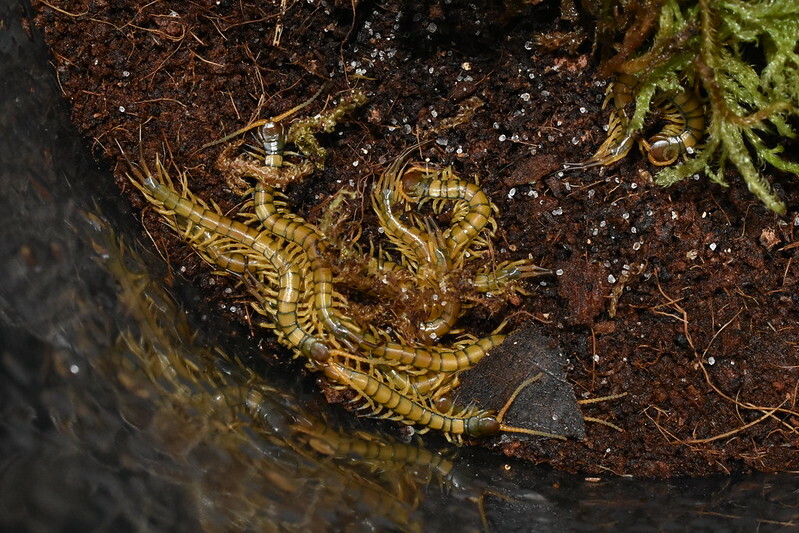 The "Mint Leg" molted and disappeared as soon as it hardened, refusing all forms of food. 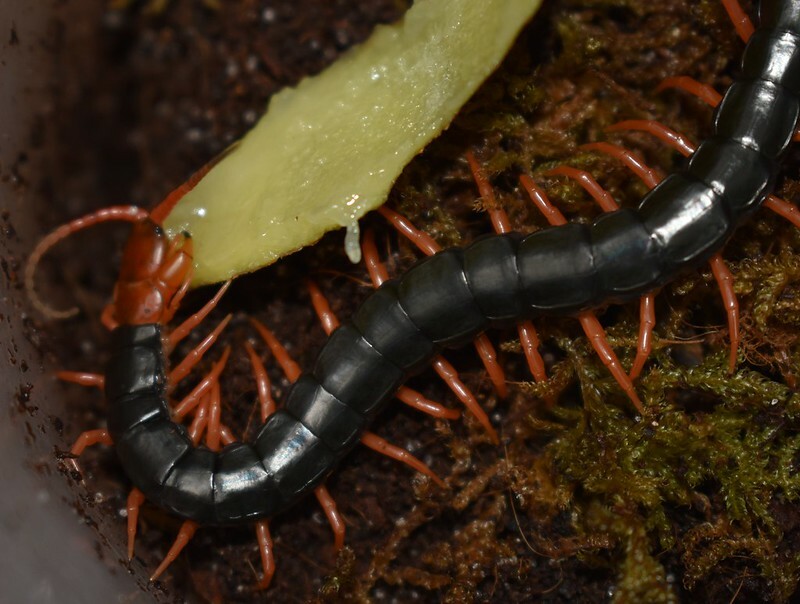 The multidens popped up this week and was obviously very hungry; I gave it a superworm and a cricket and it devoured both. 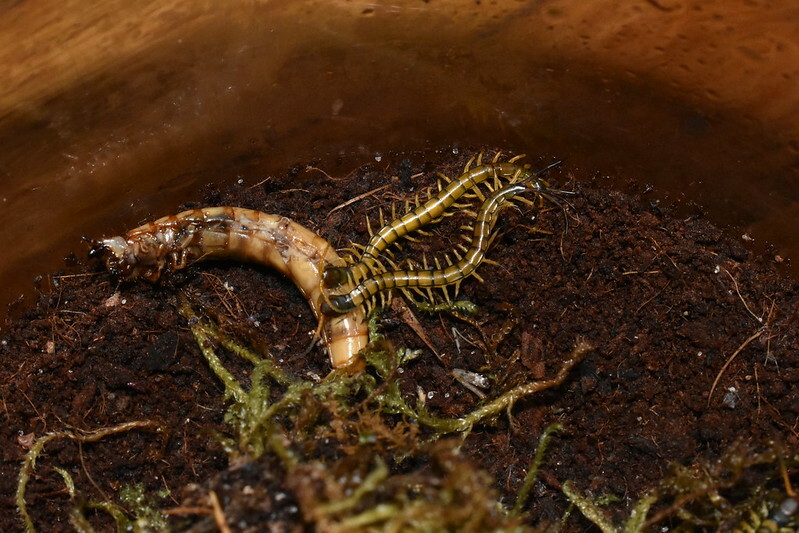 It disappeared again afterwards but at the moment has its antennae poking out of the substrate. There was weirdly warm weather this week so it may have been temperature or hunger that drove it out. The plings are active and hungry. I have them all in one jar away from their mother and they still are communal. 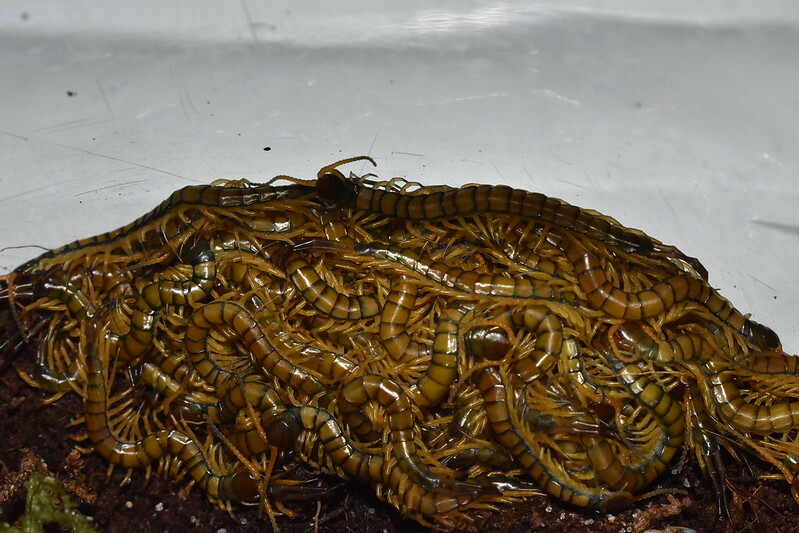 Collectively, they have eaten most of two superworms and two crickets since separation and have become quite fat. 36 plings have been separated from the main group. 15 or so are still living together and seem to be just fine together. 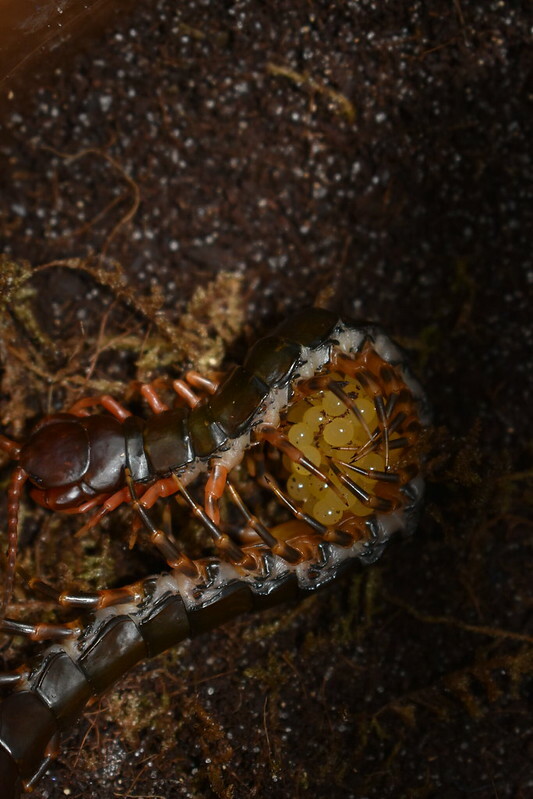 The second mother, Megaera, had her babies molt to the juvenile stage a few days ago.